Ni Lingling was born in Jiangsu, China and studied Teaching Chinese as a Foreign Language at East China Normal University in Shanghai. Later she studied Germanistic, Ancient Chinese Philology and Pedagogics at the University of Trier in Germany. She was a teacher of Chinese and Literature at the High School Affiliated to Tongji University and a lecturer of Chinese at the University of Bonn. Since April 2010, she is Lecturer of Chinese and head of the language programme at the East Asian Department of the University of Goettingen. 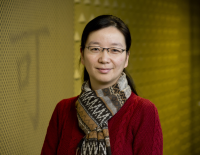 Her current research interests are didactics of Chinese, research on and development of teaching materials, Modern Chinese Linguistics and Ancient Chinese Philology.